In the course of over one year of archival research in India, I have been heartened to see how, in a few institutions like the National Archives, the country’s rotting history now has a fighting chance of survival. However, I have been deeply dismayed by one observation: the inability of my own community, the Parsis, to properly protect our own history and heritage. In many ways, the Parsi experience reflects a colossal stumbling block toward proper historical preservation in India: a dearth of public activism, support and interest, even amongst the educated and affluent. The Parsis, long considered the most progressive and socioeconomically advanced community in India, were once at the forefront of establishing and patronizing cultural institutions in Mumbai and Gujarat. We utilized our commercial wealth to help set up libraries, colleges and educational societies in the 19th and early 20th centuries. The leading savants of Europe trained our scholars and priests, who in turn maintained meticulous collections of manuscripts and voluminous libraries. With some notable exceptions, we have since fallen on hard times. Our institutions did not keep up with new scholarship and preservation techniques. Many old libraries with Parsi connections would qualify as excellent research centers — if it were still 1910. Piles of 100-year-old Encyclopaedia Britannicas, along with popular English literature from the late Victorian era, gather dust in Godrej steel cabinets. Many staff members have a limited idea about what their collections hold, and trustees have looked the other way while irreplaceable runs of 19th century newspapers have been sold off for scrap. I have been in one library where I was told I was the first visitor in four years. The case of Mumbai’s J.N. Petit Institute illustrates what has happened due to gross neglect and mismanagement. It was founded by one of the community’s most aristocratic families, one that still boasts a Raj-era baronetcy. According to Murali Ranganathan, the Petit Institute has been throwing away “entire cabinets” of valuable books. He found one such item being sold in the premises: a copy of John Locke’s An Essay Concerning Human Understanding published in 1746. The Petit Institute, he recalled, was nice enough to issue a receipt for the 40 rupees (less than $1) he paid to purchase this priceless antique volume. According to one “sadly disappointed” Parsi who was briefly affiliated with the library, and who wanted to remain anonymous, the Petit Institute suffers from ailments afflicting countless other libraries across the country: a lack of imagination, ambition and open-mindedness amongst trustees, as well as a complete disconnect with what actually goes on inside the premises. Tellingly, when I contacted library staff, they were unwilling to furnish details on the institute’s trustees, saying that they did not play a very important role (I eventually found contact information for one trustee, who did not return my calls). One library administrator simply acknowledged that the selling and trashing of books “happens everywhere” in India. Why has all of this happened in a supposedly educated, advanced community? There are many possible reasons. Parsis have steadily been losing command over their native language, Gujarati, rendering an entire corpus of knowledge inaccessible — and therefore less valuable (elderly Parsis have offered me several precious volumes, telling me that they know their children will throw them out). Community institutions have failed to recruit younger Parsis as trustees and patrons, leave alone interest them in their activities. But the most glaring problem is the hands-off approach most Parsis take toward these institutions. Within a community otherwise known for its philanthropy, there is little sense that ordinary individuals can themselves make positive contributions, financial or otherwise; there is a limited sense of public ownership and collective responsibility. When I tell Parsi audiences about rotting books and decaying collections, individuals in this wealthiest of Indian communities will, more often than not, elicit a sanctimonious “tsk, tsk” — and then promptly forget about the matter altogether. When I broach the subject of fund-raising, someone will invariably say, “Why don’t the Tatas help?,” as if this philanthropic multinational is the only actor capable of helping out. 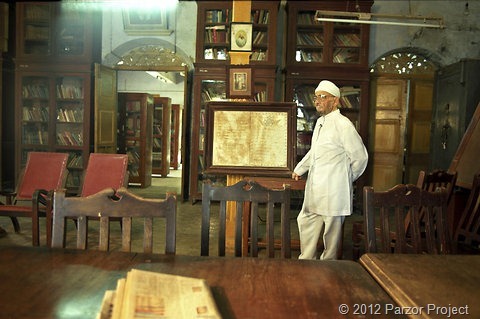 Shernaz Cama, a professor in the University of Delhi, realized the devastating consequences of public apathy when she became involved with a Unesco project to save one Parsi institution, the Meherjirana Library, in the Gujarati town of Navsari. When she arrived at the library in 1999, Ms. Cama found a Mughal sanad (property deed) on the wall covered in dust, correspondence with the court of Akbar lying on the floor and windowsills, and DDT being used on books to keep the bugs away. She quickly realized that this was not the fault of the library’s staff — preoccupied with salvaging priceless manuscripts and family trees that Parsis in Navsari were selling to scrap-paper dealers — but rather that of the wider Parsi community that was providing neither funds nor patronage. With support from Unesco and the National Archives, Ms. Cama and her foundation, Parzor, have fire-proofed and restored the library’s 19th-century building, repaired books and manuscripts, and microfilmed important collections. Scholars from India and across the world have, consequently, descended on this sleepy Gujarati town, discovering new treasures in the library. This January, for example, one doctoral candidate from Harvard, Dan Sheffield, reported having found a portion of a 14th-century Zoroastrian manuscript, the rest of which is in the British Library, that had been missing for centuries. In spite of the Meherjirana Library’s revival, Ms. Cama remains ambivalent as to whether even the Parsis can better preserve their heritage. “The Parsis definitely have the finances,” she commented, “but they also need the will and the interest to want to keep their history.” The same goes for the rest of the Indian public. I sincerely hope that, as Indians become wealthier and more educated, the Parsi experience proves to be the exception, rather than the rule, to how the past is treated. Dinyar Patel is a Ph.D. candidate in history at Harvard University, currently working on a dissertation on Dadabhai Naoroji and early Indian nationalism. He can be reached at dpatel@fas.harvard.edu.